Jonathan “Gabby” Price spent the last seven years taking Husson University football from a bold idea on paper to a regional power on the gridiron. For that reason, Eagles players were surprised and saddened Monday to learn their head coach has resigned. Husson announced Price’s decision Monday, the day team members received a letter informing them of the move. The 60-year-old Price, who guided the Eagles from pre-club status in 2002 to a 7-3 record and an ECAC Northeast Bowl berth in 2008, has been in this position a few times before. Last week, after much thought, he opted to step down. Price, who enjoyed two successful coaching stints at Bangor High School, put Husson football on the map after the program was reinstated in 2002. The Eagles went 25-28 in six seasons, including a 19-10 mark the last three years. “I have many emotions, but in this case it’s a good thing,” Price said of his resignation. Gilbert and his teammates are having a difficult time believing that could be true. “He was the heart and soul of that program. He was the one who created it,” said Gilbert, who spent Monday fielding calls and messages from teammates who wanted to know why Price had resigned. Husson athletic director Cindy Connelley lauded Price for his impact on the school. Connelly said Husson will implement a search for a head coach in the coming weeks. In the meantime, Gilbert and the Eagles will try to handle the unexpected change the way Price would have expected. 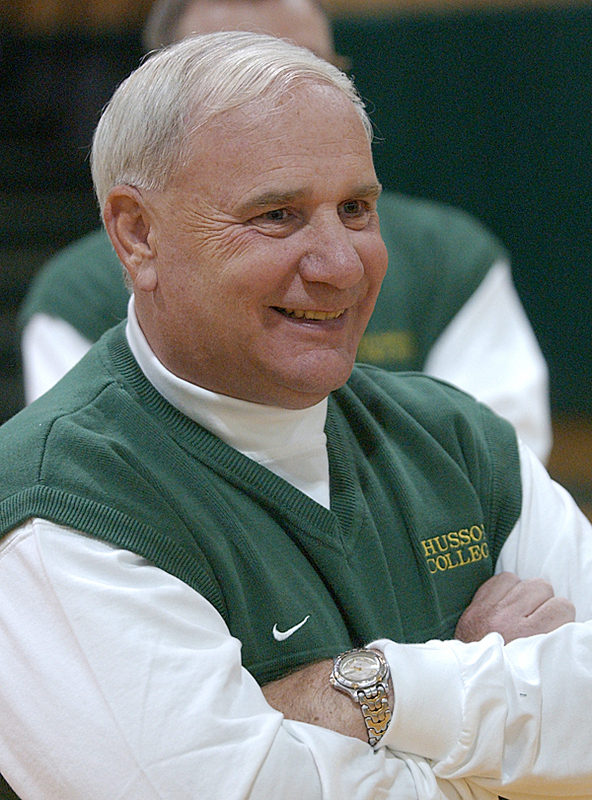 Price said he twice had discussed with Husson president Bill Beardsley the possibility of stepping down this spring. “Gabby is the student-athlete’s coach,” Beardsley said in a statement. “He challenges them, works them hard and praises their academic pursuits just as much as what they do on the field. “Gabby is one of the finest people and most charismatic coaches I have ever had the honor to work with,” he added. Price, who also was Husson’s AD for five years before resigning last August, lauded those around him for what the program has accomplished. Price thanked former Husson dean of education Jim Doughty for laying the groundwork. 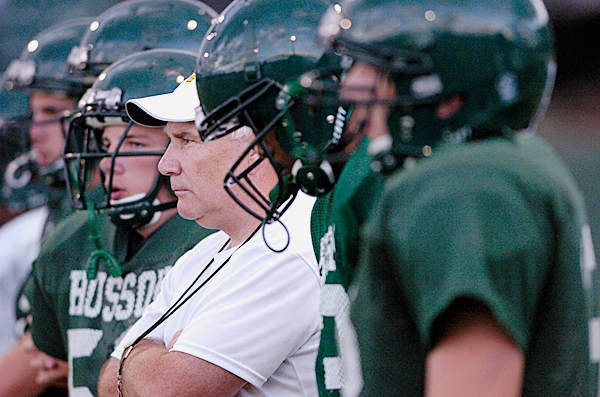 “It was really under his direction that Husson football became a reality,” Price said. 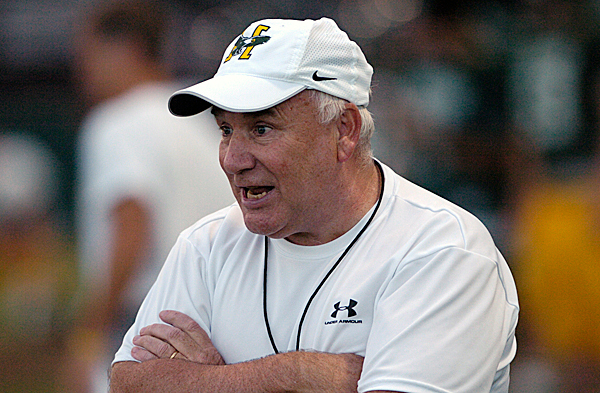 Price is confident Husson football is positioned well to continue its growth and success. This fall, Husson joins the fledgling Eastern Collegiate Football Conference. The players, including a large group of seniors, are equally enthusiastic. They had hoped Price would lead the way. Gilbert said Husson has set its collective sights on winning the ECFC championship. “I want nothing more than to look up to [Price] after the last game and say, ‘this is all for you,’” he added. Among the potential candidates to succeed Price is Nat Clark, Husson’s assistant athletic director for student wellness and the Eagles’ offensive line coach and special teams coordinator. The former Bangor High and University of Maine player has spent six seasons with the Husson football program. Gilbert, who starred at Foxcroft Academy, is at Husson for the second time. After things didn’t work out at UMaine, and he contemplated giving up football, he went to Husson. He described Price as a father or grandfather figure. And Gilbert needed guidance. Gilbert then transferred to Division I Albany, but didn’t find what he was looking for. Price welcomed him back. Price, a former Bangor High and UMaine standout, began his coaching career as an assistant at Bangor from 1973-75, then took the Rams’ head job in 1976. He directed Bangor to a 60-27-1 record with two state titles (1979, ’81) in nine seasons. After a seven-year hiatus, Price returned and led the Rams to a 69-25 mark and three playoff berths from 1992-2000. Price, an investor in local businesses including The Ground Round, The Corner Store and Seamus’s, looks forward to the future. While he didn’t rule out a return to the sidelines, Price likely will relish time with his family, including 22-month-old grandson R. Edward “Teddy” Stephenson. Gilbert will try to embrace one of Price’s lessons as he comes to grips with his mentor’s departure. “He told me one time, the things we love in life we tend to squeeze and push and force the issue,” Gilbert said. “When you love something, the worst thing you can do is squeeze too tightly; you have to let it fly. I’m trying to keep that idea as I go on, especially without him.